Thank you for visiting our website and learning about the Major Crisis Relief Fund (MCRF). We look forward to working together to help our Cape and Islands prepare for and respond to disasters. 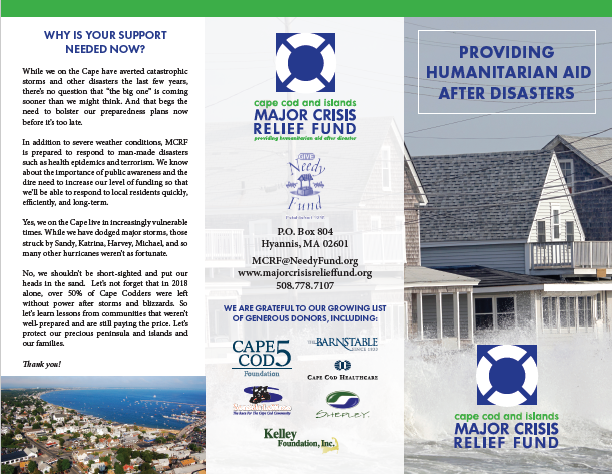 The Major Crisis Relief Fund was established in 2016 by the Cape Cod Times Needy Fund, a registered 501(c)(3) charitable organization, to fill existing service gaps in private and public funding for crises, particularly in terms of long-term recovery assistance. While the Needy Fund provides urgent financial assistance throughout the year to individuals and families residing on the Cape and Islands who are experiencing temporary financial hardship, it could not meet a dramatic increase in unmet needs following a disaster such as Hurricane Sandy. Therefore, the MCRF was created to provide humanitarian aid on the Cape and Islands during major crises. We are grateful to our local leadership team, including the dedicated MCRF Advisory Committee comprised of local emergency response professionals and the Needy Fund Board of Directors. With their help, we will apply a disciplined process for providing aid in much the same way we do with the Needy Fund to be certain that funds are used efficiently. Our commitment is to be accountable to donors and responsive to local residents most severely affected by disaster. Please join us in this critical initiative to keep our precious Cape and Islands strong. We ask for your help in sustaining the Major Crisis Relief Fund by donating or volunteering. And if you think you are eligible for disaster aid, please contact us. Again, thank you for helping us meet critical humanitarian needs across the Cape and Islands when disaster strikes.